MOUNTAIN VIEW, Calif., Feb. 6, 2018 /PRNewswire/ -- CEVA, Inc. (NASDAQ: CEVA), the leading licensor of signal processing platforms and artificial intelligence processors for smarter, connected devices, today announced its financial results for the fourth quarter and year ended December 31, 2017. Total revenue for the fourth quarter of 2017 was $21.6 million, an increase of 2% compared to $21.2 million reported for the fourth quarter of 2016. Fourth quarter 2017 licensing and related revenue was $9.0 million, an increase of 9% when compared to $8.3 million reported for the same quarter a year ago. Royalty revenue for the fourth quarter of 2017 was $12.6 million, a decline of 2% when compared to $12.9 million reported for the fourth quarter of 2016. Gideon Wertheizer, Chief Executive Officer of CEVA, stated: "Our fourth quarter results marked a strong finish to the year, with thirteen licensing agreements concluded and a sequential increase in royalties. Notably, we signed a development agreement with a large automotive manufacturer for the next generation of our NeuPro AI processor targeting level 4 and 5 autonomous driving systems." Mr. Wertheizer continued: "2017 was an outstanding year for CEVA, with record financial and business achievements, reflecting our traction in the smart and connected universe. Our licensing business continues to thrive, with forty-five agreements concluded, resulting in 35% licensing revenue growth. We entered into strategic engagements with multiple top tier players in 5G infrastructure, artificial intelligence and computer vision, all of which bode well for future royalty growth. We also further strengthened our technology leadership in a number of key growth areas with the introduction of new products, among which are: CEVA-XC12, the most advanced DSP for infrastructure and networking applications; Dragonfly, a complete end-to-end solution for narrowband IoT; NeuPro, the first self-contained processor architecture for AI at the edge; ClearVox, a complete front-end voice processing software suite for voice-enabled devices and AI assistants, and Bluetooth 5 dual mode, the key enabling technology for the proliferation of wireless headsets, hearables and earbuds. Our royalty revenue also reached an all-time high, growing 9% year-over-year, with close to 1.2 billion CEVA-powered devices shipped by our customers. Looking ahead, we will continue to relentlessly expand our customer base and market presence, leveraging our unique specialization and holistic product strategy to lower market entry barriers for complex technologies." During the quarter, CEVA completed 13 license agreements. Nine of the agreements were for CEVA processors, platforms and software, and four were for CEVA connectivity IPs. All of the licensing agreements signed during the quarter were for non-handset baseband applications and five were with first-time customers of CEVA. Customers' target markets for the licenses include 5G cellular backhaul, cellular IoT, computer vision and AI for smartphones, consumer electronics and automotive, voice processing in headsets and Bluetooth connectivity for a variety of IoT-related products. Geographically, five of the deals signed were in China, two were in the U.S., one in Europe and five were in the APAC region, including Japan. GAAP net income for the fourth quarter of 2017 decreased 39% to $3.2 million, compared to $5.2 million reported for the same period in 2016. GAAP diluted earnings per share for the fourth quarter of 2017 decreased 42%, to $0.14 from $0.24 a year ago. Non-GAAP net income and diluted earnings per share for the fourth quarter of 2017 were $5.7 million and $0.25, respectively, representing a 18% and 22% decrease, respectively, over the $7.0 million and $0.32 reported for the fourth quarter of 2016. Non-GAAP net income and diluted earnings per share for the fourth quarter of 2017 excluded: (a) equity-based compensation expense, net of taxes, of $2.3 million, and (b) the impact of the amortization of acquired intangibles of $0.3 million associated with the acquisition of RivieraWaves. Net income and diluted earnings per share for the fourth quarter of 2016 excluded: (a) equity-based compensation expense, net of taxes, of $1.5 million, and (b) the impact of the amortization of acquired intangibles of $0.3 million associated with the acquisition of RivieraWaves. Total revenue for 2017 was $87.5 million, an increase of 20% compared to $72.7 million reported for 2016. Licensing and related revenue for 2017 was $42.9 million, representing an increase of 35% compared to $31.9 million reported for 2016. Royalty revenue for 2017 was $44.6 million, representing an increase of 9% compared to $40.8 million reported for 2016. U.S. GAAP net income and diluted net income per share for 2017 were $17.0 million and $0.75, respectively, an increase of 30% and 23%, respectively, compared to $13.1 million and $0.61, respectively reported for 2016. Non-GAAP net income and diluted earnings per share for 2017 were $26.6 million and $1.17, respectively, also representing an increase of 31% and 26%, respectively, over $20.4 million and $0.93 reported for 2016. Non-GAAP net income and diluted earnings per share for 2017 excluded (a) equity-based compensation expense, net of taxes, of $8.4 million, and (b) the impact of the amortization of acquired intangibles of $1.2 million associated with the acquisition of RivieraWaves. Non-GAAP net income and diluted earnings per share for 2016 excluded (a) equity-based compensation expense, net of taxes, of $6.0 million, and (b) the impact of the amortization of acquired intangibles of $1.2 million associated with the acquisition of RivieraWaves. Yaniv Arieli, Chief Financial Officer of CEVA, stated: "We are very proud of the company's performance over the past year. Among the numerous financial and business milestones reached in 2017 were record annual licensing revenue, royalty revenue, non-GAAP net income and earnings per share. We also generated $24.5 million over the course of the year from operating cash flows that continued to strengthen our balance sheet with our cash balance, marketable securities and bank deposits totaling approximately $183 million at year end, with no debt." On February 6, 2018 CEVA management will conduct a conference call at 8:30 a.m. Eastern Time to discuss the operating performance for the quarter. This press release contains forward-looking statements that involve risks and uncertainties, as well as assumptions that if they materialize or prove incorrect, could cause the results of CEVA to differ materially from those expressed or implied by such forward-looking statements and assumptions. Forward-looking statements include Mr. Wertheizer's statements that strategic engagements with multiple top tier players in 5G infrastructure, AI and computer vision bode well for CEVA's future royalty growth and CEVA's desire to expand its customer base and market presence by leveraging CEVA's unique specialization and holistic product strategy to lower the market entry barriers for complex technologies. 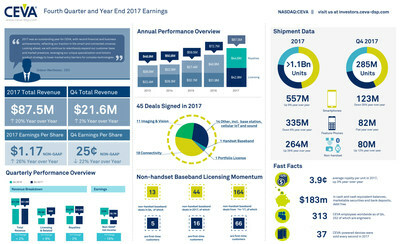 The risks, uncertainties and assumptions include: the ability of the CEVA DSP cores and other technologies to continue to be strong growth drivers for us; our success in penetrating new markets, including in non-baseband markets, and maintaining our market position in existing markets; our ability to diversify the company's licensing customers and royalty streams, the ability of products incorporating our technologies to achieve market acceptance, the speed and extent of the expansion of the 4G, 5G and LTE networks, the maturation of the IoT and connectivity markets, the emergence of AI, the effect of intense industry competition and consolidation, global chip market trends, the possibility that markets for CEVA's technologies may not develop as expected or that products incorporating our technologies do not achieve market acceptance; our ability to timely and successfully develop and introduce new technologies; and general market conditions and other risks relating to our business, including, but not limited to, those that are described from time to time in our SEC filings. CEVA assumes no obligation to update any forward-looking statements or information, which speak as of their respective dates.